Apple and Samsung have been long running rivals till now. Their war is not limited to just the smartphones only and has extended to the tablet arena as well. Following is a comparison between their best two of their best tablets, i.e., Samsung Galaxy Note 8 and Apple iPad Mini that will help you to understand how they fare against each other. Samsung Galaxy Note 8 is great in the design as well as the appeal and the polished white surface of the device blends nicely with the silver accents that are integrated in the device. The rounded corners impart further appeal to the device. As Note 8 is quite slim, it is very handy and you can easily operate the device holding it in one hand and stylus on the other. However, Apple iPad Mini goes a further step ahead as it provides a more premium feel with its superb finishes effects. Even though it looks nice, but the plastic finish of the Note 8 isn’t any threat to the iPad Mini. The sleek glass and aluminum uni-body of the device is among the best in class. 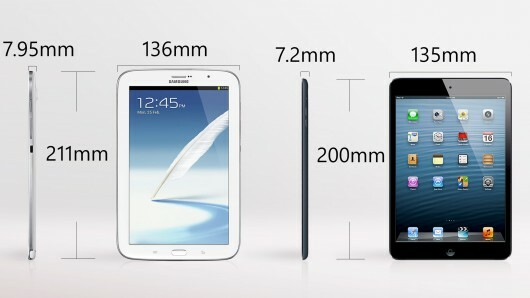 A tablet is considered as a more advanced version of a smartphone and people expect a certain level of features in it. However, Samsung Galaxy Note 8 goes a step ahead in providing you features that aren’t there in Apple iPad Mini. Among the most noticeable features of Note 8 is the S-Pen. This active stylus is highly appreciated by the users. Also, this stylus is quite advanced from the styluses that you have used till now. The other cool features of this device include an in built infrared remote, Multi Window application as well as support for SDXC cards, which can enhance the storage of the device. 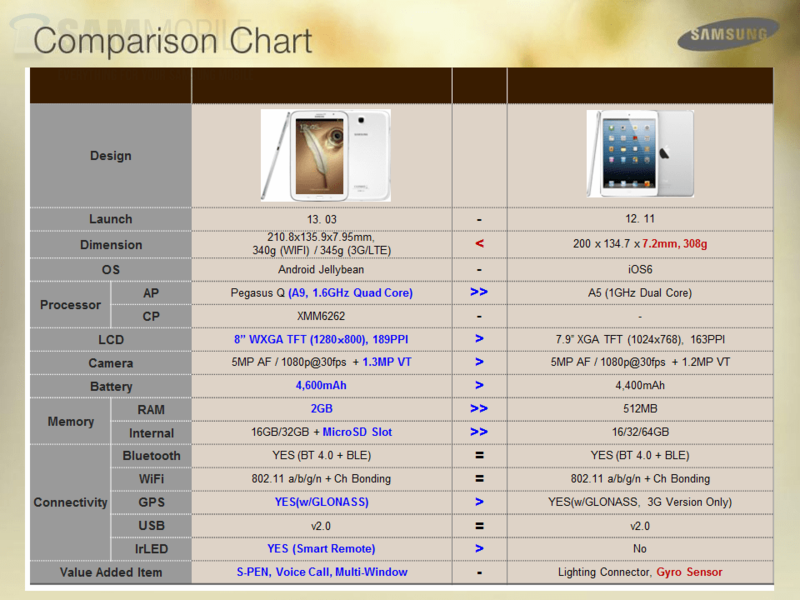 On the other side, Apple iPad Mini also has got some plus points but they are more limited to iOS platform. Some of the most amazing features of Apple iPad Mini will include Siri, iMessage, iCloud and AirPlay. Still, the lack of compatibility of third party apps and absence of expandable storage are a few minuses of this device. The beautiful 8 inch screen of Samsung Galaxy Note 8 is backed with a display of 1280 x 800 pixels, which will translate to 189 ppi. 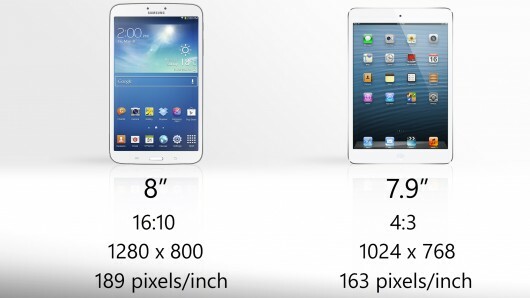 On the other hand, the 7.9 inch deeply of iPad Mini provides a 1024 x 768 pixel resolutions translating into 162 ppi. It’s not just the pixels of the screen in which the Samsung Galaxy Note 8 leads but also the brightness and the contrast. The screen of Note 8 is also as reflecting as Mini’s and the colors more richer, providing a better experience to the user. Even though both of these tablets are the most popular tablets ever introduced, there are some specific areas in which one leads the other. They are quite evenly matched but few things like expandable storage, third party apps compatibility and stylus gives an undue advantage to the Samsung Galaxy Note 8. We know that most of the Android smartphones and tablets have external micro-sd card option and this is really benefitting. Purchasing a 16GB tablet and then inserting a 16/32/64 GB card expands the storage in cheaper way. Also if you already have data in your memory card then Android will show to you by using its file system. Galaxy Note 8 gives enables this option for us whereas iPad Mini does not. Summary : The Galaxy Note 8 wins over iPad Mini because it includes a faster processor for apps and games, a higher resolution screen, s-pen which is fantastic, fast multi-tasking, more memory. With Android you can get more roms and customise your tablet. However iPad Mini is less pricier and is house in an good quality aluminium housing.